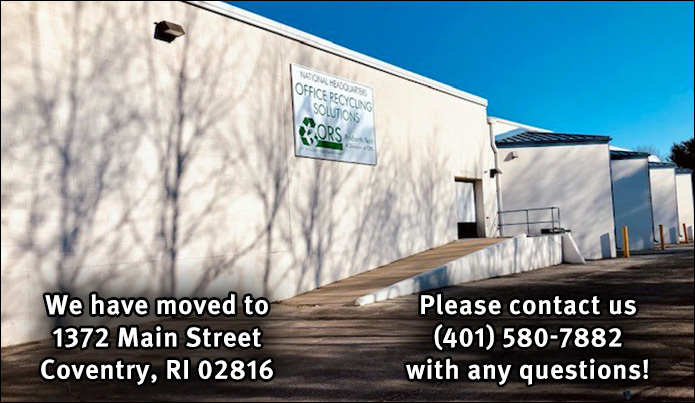 Office Recycling Solutions is a LOCAL, RIOS (Recycling Industry Operating Standard) and R2 Certified* New England company that is more than capable to handle all of the electronic and universal waste recycling needs of businesses, residents, government agencies, non profits and educational organizations. Our company has been at the forefront in the state on training and partnering with many local organizations. We currently work with numerous cities and towns in several states on their e-waste recycling programs. We are the only company of its type in RI and count many local companies, universities, municipalities and non-profits as partners! We are also the ONLY company in RI with contract arrangements with many of the largest electronics manufacturers on handling the independent collection programs approved by the states. Since its formation in 2005, ORS has grown into the largest e-waste recycler of its type in Rhode Island. We can handle ALL of your electronic and universal waste needs from TVs, CRT Monitors, lamps, batteries, CPUs and all other items such as printers, cartridges, wire and cable, UPSs, etc. ORS operates as a Large Quantity Handler Destination Facility for the collection, consolidation and dismantling of universal waste. We are R-2 certified and are required by state laws to appropriately track and manage universal waste and have procedures in place to protect the environment during transportation and handing. *The Responsible Recycling Practices Standard (R2) certification, which is recognized by the Environmental Protection Agency (EPA), is a set of voluntary principles and guidelines designed to promote and assess responsible practices for electronics recyclers. Please click this link to visit their website.